What a brilliant day we had yesterday at the electric bike event organised by Bristol Council in conjunction with Batribike dealer Atmosphere. It was an early start for us (4.30 a.m!!) as we we drove down from our base near Lincoln. We were all set and ready by 10 o'clock and waiting for the public. The lovely thing about being out and about at different locations is that you get to see all sorts of places you wouldn't perhaps normally see. 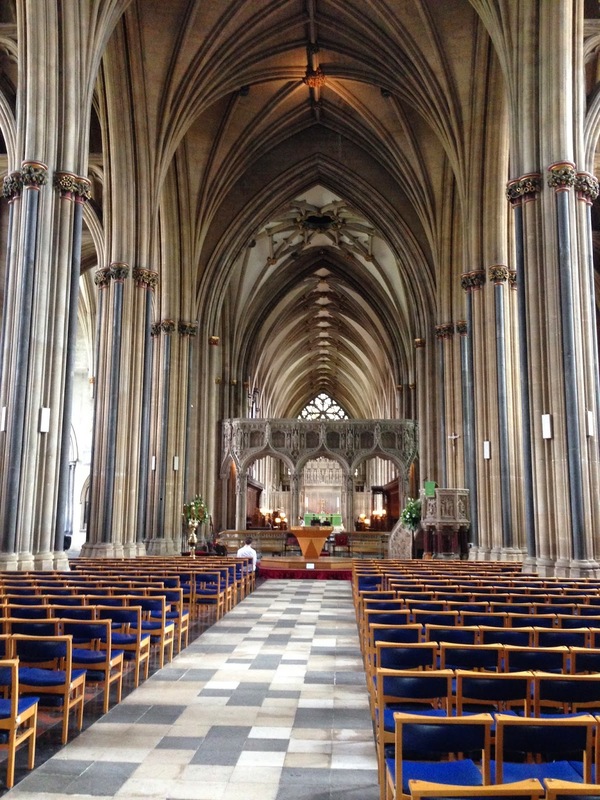 This time it was Bristol Cathedral. I was told that there were toilets for the event in the Cathedral. 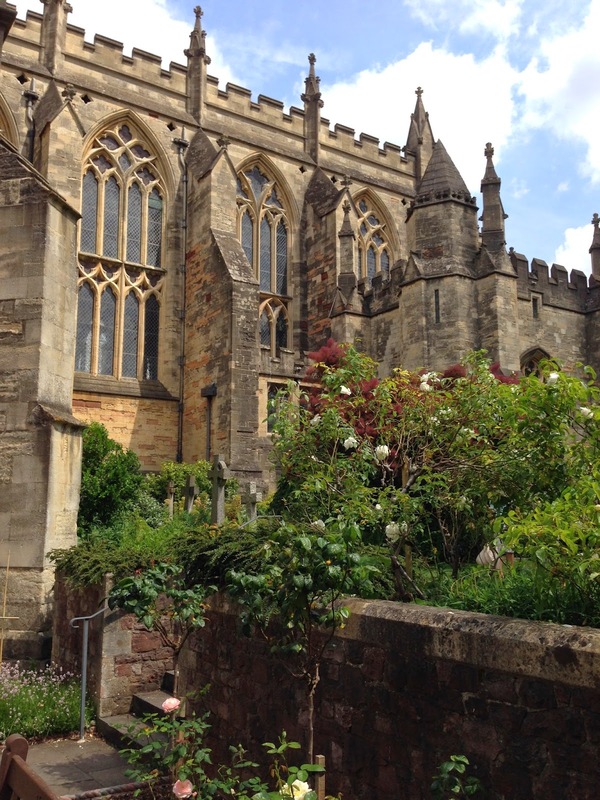 What a treat it was to go inside and see the lovely architecture. I even went out into the courtyard garden. We were very busy with test rides going on all day - even at the end of the day when everybody was trying to pack up - we still had people out riding the Breeze. They wanted to try the Breeze particularly because they had been watching people test riding and said that everyone they had seen on the Breeze had looked very comfortable and happy. I am delighted that having ridden it they immediately asked if they could order one! All the Batribike bikes had lots of interest but particularly the Dash Pro and Breeze - both folding electric bikes. Also on show we had the Cykell tow ball mounted cycle carrier. We had it mounted on a display stand so that we could demonstrate how easy it is to fit. We had several people come and say "Well show me this fantastic new rack" in a way that showed they didn't think that they would be impressed. Once we had demonstrated it their reaction was "Wow! That's brilliant! 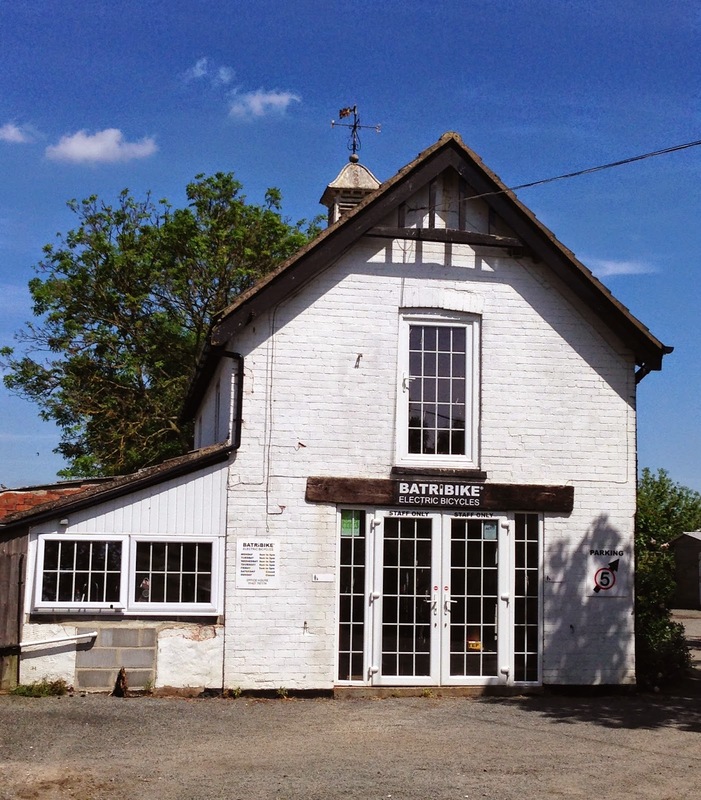 Fantastic design"
All in all, a lovely day out in the sunshine and lots of lovely people riding the Batribike bikes. The new Dash Pro and Cykell bike carrier are in at the warehouse now so I have been out and about on a three day tour of the West Country demonstrating them to some of our dealers. The weather was lovely for driving and the countryside was spectacular. At the moment everything is really green, as the summer progresses the fields turn browner and loose that newness that they have at the moment. I headed all the way down to Cornwall to the very south west of the country to visit Top Gear electric bikes at Penryn just next to Falmouth. Coming back to Devon I crossed the Tamar Bridge and had to stop to take a picture. The Royal Albert Bridge carries the railway and was designed by one of my heroes, Isambard Kingdom Brunel. Last time I was here it had scaffolding on it as repairs were being made. It was good to see it out in the open again. When I called in at Route 2 Bike Shop at Topsham Quay near Exeter I met a very happy customer who has a Granite Pro in orange. 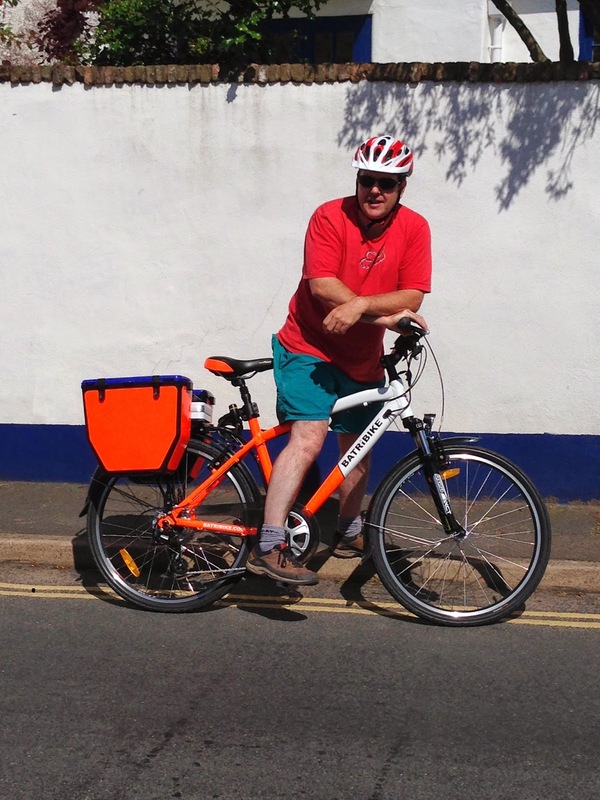 He is a tradesman and used his electric bike for work so he has added panniers to carry his tools (complete with matching orange decals) and sometimes he also tows a trailer. He said that he was really enjoying his bike and that the hills held no fear for him now. Heading off to Weymouth I took the scenic coastal road and was treated to a spectacular view of Chesil Bank. The 18 mile long shingle beach is a UNESCO World Heritage site. From there it was time to head home the wild flowers on the roadside verges had been lovely for the whole trip but I couldn't resist these Oxeye Daisies I found near the New Forest. 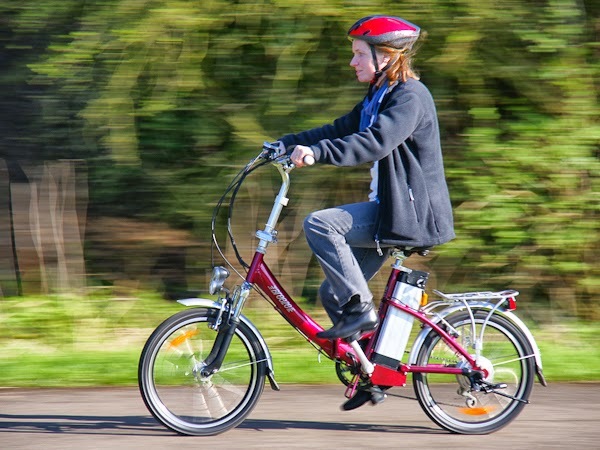 We are off to the Electric Bike Festival in Bristol tomorrow so I hope the weather stays fine. Yesterday I went on the MP's and Peers bike ride in London. The event traditionally heralds the start of Bike Week, promoting cycling to all. The cycle ride started early with breakfast and speeches at the Dutch Embassy. Then the MET Police marshalled everyone over the road to Kensington Gardens where we all assembled in front of the Albert Memorial for photos. I had driven in earlier with a folding bike in the boot, I parked a little away from the Embassy and cycled in. I was lucky enough to be riding the new Dash Pro in orange/white which looked stunning in the sunshine. I know this because I had so many comments from other riders at the event who wanted to know all about it. Pictures over, the ride was lead out by the Dutch Ambassador Laetitia van den Assum and Robert Goodwill MP Minister for Transport. It was a glorious day for a ride, especially amongst so many of London's great landmarks. As we left the Albert Memorial with the Albert Hall on our right we headed out into Hyde Park and through the Wellington Arch at Hyde Park corner. After that we rode down Constitution Hill to Buckingham Palace and onto Birdcage Walk all the way down until we saw the tower that holds Big Ben at Westminster. It always fascinates me that I can be here in this great City riding past these iconic places, I almost have to pinch myself! Once we arrived at Westminster we were shepherded through the gates to park our bikes in the garden outside the House of Lords. 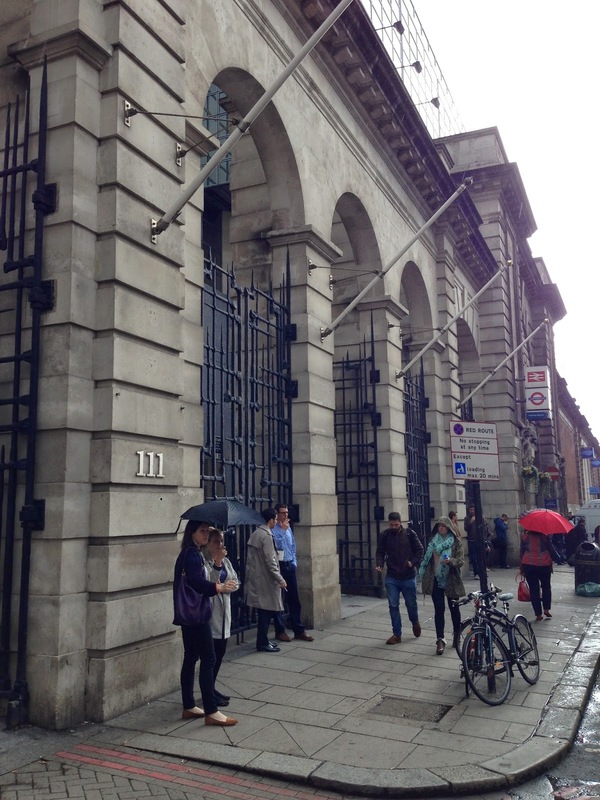 Taking our bags through the security scanners and receiving visitors passes we headed into one of the committee rooms to hear members from all parties outline their vision for cycling. I even managed to pose a question about electric bikes! Then it was time to ride back to the car. Coming back past Buckingham Palace there were huge numbers of tourists watching and listening to the military band playing in front of the Palace. Riding a slightly different route back through Hyde Park I passed the Serpentine lake and the Princess Diana Memorial Fountain all so evocative of summer with the fragrant smell of roses in the background. And so ... back to the office to download my pictures and ponder on how lucky I am to get such a great day out. 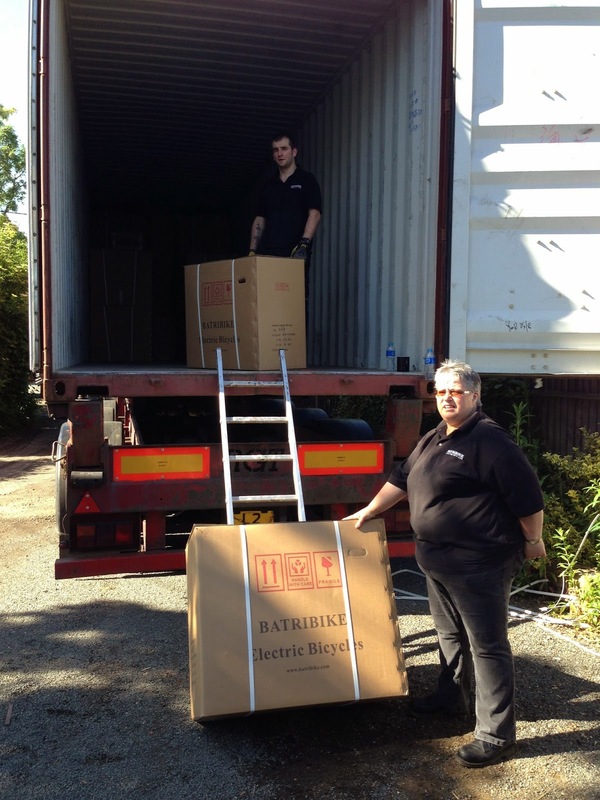 It was all hands on deck this morning with so many deliveries arriving in the Batribike yard. It was, and still is a glorious morning with the sun shining. Firstly we had a delivery of folding electric bikes - the new Dash Pro in the stunning orange/white and blue white colouring and the exceptional value Breeze which now has the uprated 10.4Ah battery with Samsung cells. 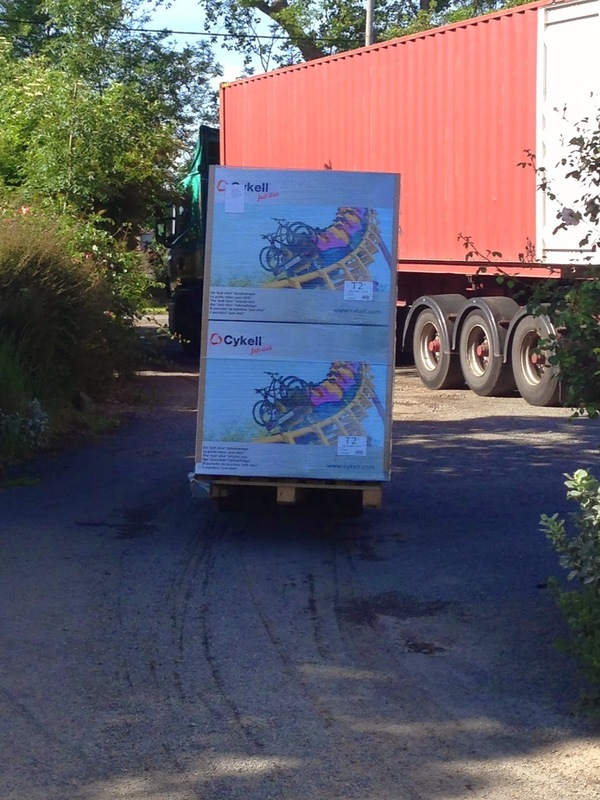 Then before we had chance to unload the exciting new Trike-R another delivery arrived! We had to get past the container lorry on the drive to get the the other large delivery wagon that was out on the road. 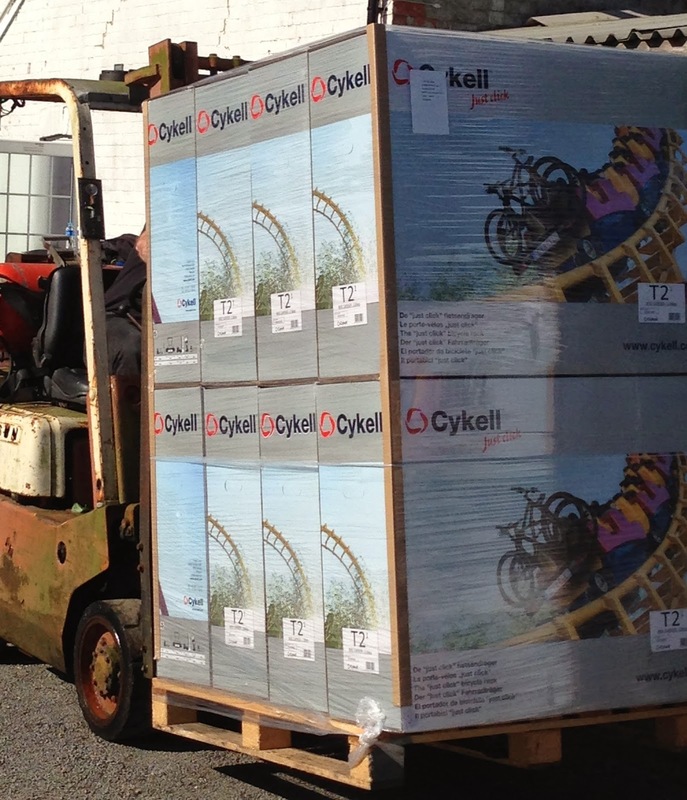 We soon had the Cykell bike carriers unloaded and could go back to finishing the first delivery. Whew what a busy morning! The Cykell tow ball mounted bike carrier is a new product to Batribike. We are the UK distributor for this exciting new bike rack that has been taking Belgium by storm. The bike rack is the winner of a Red Dot 2014 design award and is super easy to use straight out of the box. The Cykell bike carrier is compact when folded, then, the just click system allows the user to extend the lights and wheel trays easily. Place the carrier onto the tow ball, unfold and just click. The green indicator shows that the rack is fixed securely. For more information on the Cykell bike carrier check out the Batribike website. Yesterday I was representing BEBA (the British Electric Bicycle Association) on a visit to London. 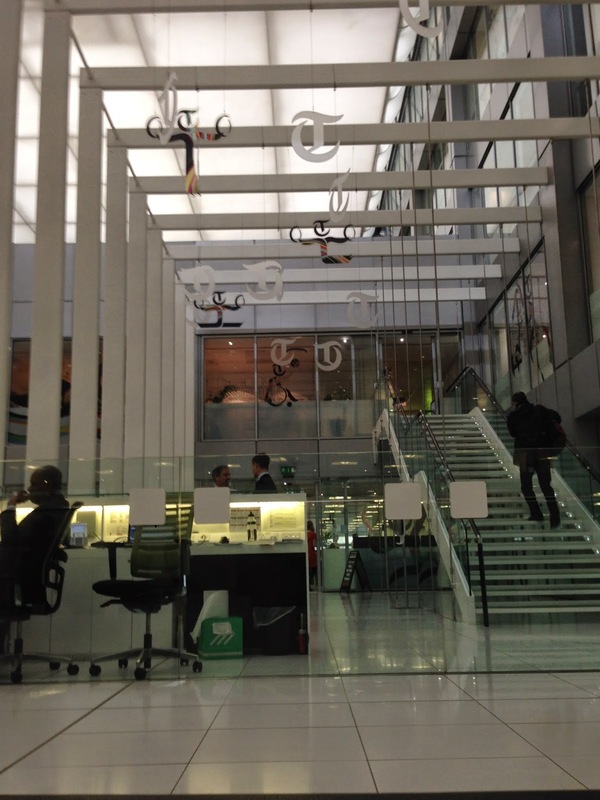 I was lucky enough to have an invite to a meeting at the plush new offices of the Telegraph newspaper group at 111 Buckingham Palace Road to discuss future electric bike awareness events. I hopped on the train and the Tube and arrived at Victoria. Despite the slightly drizzly weather the City was buzzing. There seemed to be tourists everywhere and it was a job to walk along the pavement. The front of the offices are hidden behind a grand stone façade. Behind the courtyard the entrance is all steel and glass, with overhanging roof and revolving doors. Once inside I was directed up the escalator to the first floor reception, a lovely modern atrium with more glass. The offices in a horseshoe on the floors above all look out onto the central space. After the meeting I was back on the train and back to reality! A very nice and productive trip out.